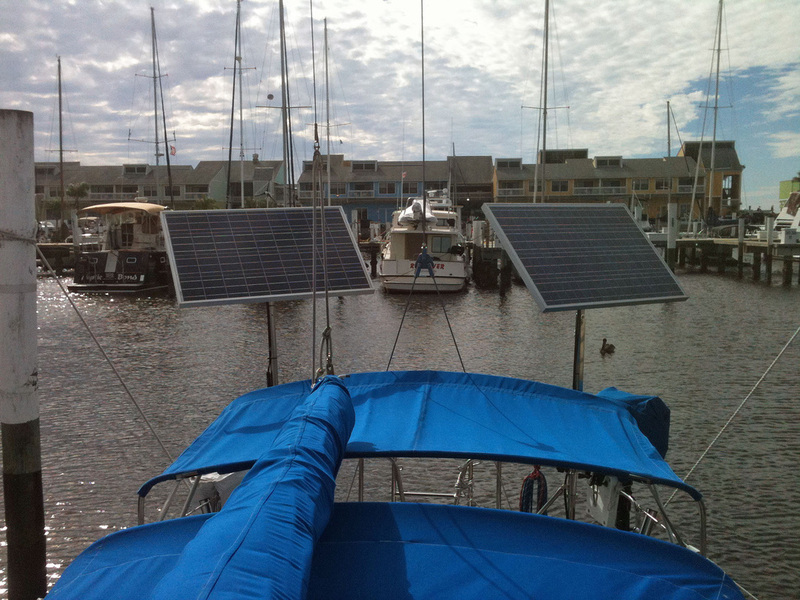 Customers - First Mate Marine Inc.
See our Gallery of Solar Panel Installations to see how owners have installed their solar panel systems. The panels have sustained 35-40 knot winds with no trouble at all. Just got back into cell range. Thank you for all the help in designing our two panel solar system. They are meeting our expectations beautifully. The panels have sustained 35-40 knot winds with no trouble at all. "Thank you Tom. Your design is terrific and your equipment is working flawlessly." 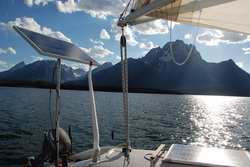 We like to anchor out most of the time while cruising but found we had to run our generator at least two hours a day to charge our battery banks. The constant concern about the state of charge of our batteries and the noise of our generator running was undesirable to us. As luck would have it, we met Tom of Custom Marine Products while cruising in the North Channel of Lake Huron and he had a solution for us. Tom designed our solar system and provided us with the components. Our local yard did the installation. 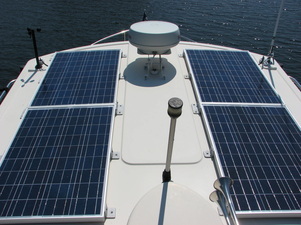 4 105 watt panels wired in parallel on the pilot house roof. 2 controllers located near the battery boxes. This summer we only had to run our generator if we had a long string of cloudy days which was only once. What a wonderful improvement to our cruising experience. The monitors (controller remote displays) tell me exactly how the panels are performing and the state of charge in my battery banks. For anyone reading this, I suggest you contact Tom. His email is tdtrimmer@gmail.com. You will find him excellent to work with, very knowledgeable and helpful. "We loved our first panel so much we decided to get another." Our second pole with the integrated engine hoist will help our aging backs. 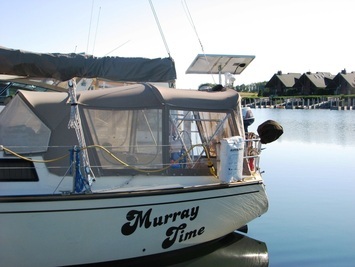 Thank you for working with us as we get our boat ready for full time cruising. 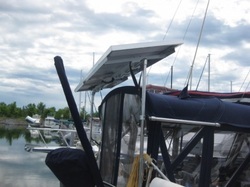 Note: Kevin and Lynn added a second 90W solar panel with a top-of-pole mount and the optional outboard motor hoist in preparation for their new cruising life style. 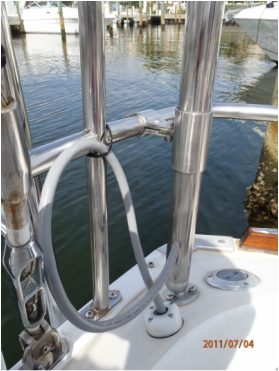 Kevin used our 90 degree tab sleeve with our fixed sleeve lock to effectively strengthen the pole mounting system with struts so they don't have to rely on the strength of their stern rails. See picture. "So, early data is better than expected or should I say better than I expected." Everything arrived in good shape. However, FedEx must be getting annoyed with Xmas season fast approaching because the exterior of the boxes were terrible. After all “Fragile” is Italian for stomp all over me. I mocked placement on just about every possible area and settled on the aft starboard corner just on the downward slope of the transom. 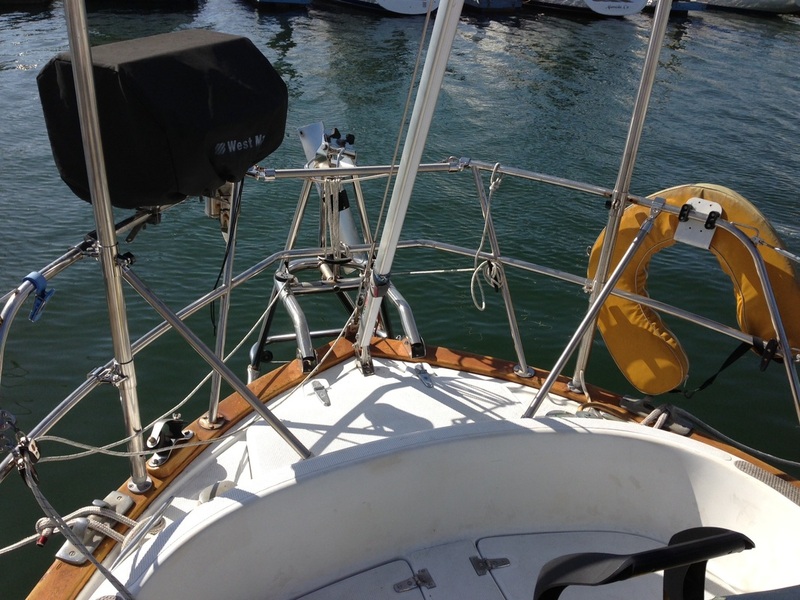 Pole is resting on the ball mount and I clamped the upper and lower rail mounts to the stern seat rails. The pole is quite high and somewhat unstable toward the top, That's why I am requesting an additional locking collar to connect to the steel arch. Running the wires was a non-event! 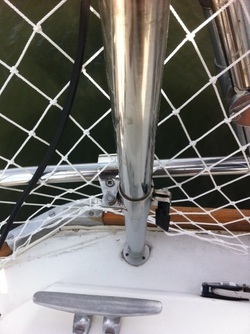 Access in the stern lazaret exposed an open 1 1/2’ PVC chase that had one ground wire running through it! 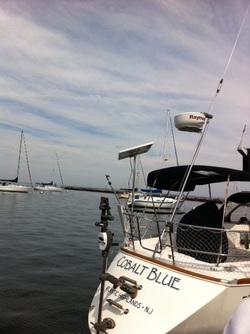 We pushed the fiberglass fish through and the chase terminated right at the panel and the batteries. We had a very clear and bright day for the installation and initial setup. So, early data is better than expected or should I say better than I expected. That's about 210 watts being produced by our 160 watt rated panel. Wow! Once final connections were made, I shut off shore power and played with turning various things on. The center photo is with the entire 12v side TURNED ON, Bose Entertainment system (Captain Ron), freezer, refrigerator, all pumps, all lights (LED’s) and the panel was still “adding” 0.3 amps to the batteries…… The last picture shows the panels pushing 21.9 volts and adding 2.2 amps with the Fridge, freezer and stereo on…. "The panel worked brilliantly all summer." I am thinking of leaving the panel up all winter to charge the batteries. Is this considered okay? 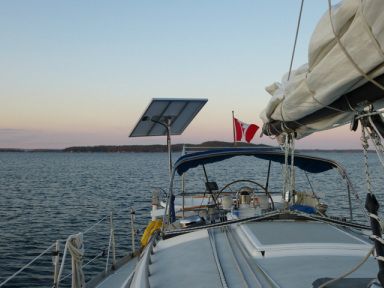 The panel will be snowed on and have alternating freeze/thaw cycles while the boat is on the hard at Mahone Bay, Nova Scotia. By the way, the panel worked brilliantly all summer. I was fogged in for three days at Sambro and never had to start the engine once for electrical power. I used it for everything except the fridge/freezer. I even charged my Torqeedo electric outboard off of it. And my batteries are not very large -- just 240 Ah of lead acid. If you look carefully in the photo you will see red tape near the top of the post. This is to cover the unused holes in the pole. With a wind up, the holes turned the pole into a giant flute that sounded almost exactly like a whistle buoy! Yes, your solar panel should be just fine staying up in the winter. Both the electronics and the panel itself are well sealed and the pole mounting system should be plenty strong to support a snow load. I would tilt in panel at a more significant angle than normal so the snow will be more likely to slide off. Face the panel south and you will have plenty of power to keep the batteries at full charge. You are the first person to report on the musical talent of the pole. I wonder if we can claim that as a feature. :-) I'll check into offering rubber hole plugs for the pole for those not using the crane option. Thanks for the input. "Everything I was told has panned out." 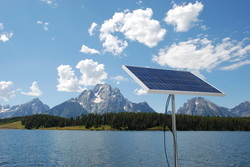 140 watt solar panel mounted on a pole. I purposely waited 2 seasons to really test my solar panel installation. Everything I was told has panned out. I fully recommend CMP. 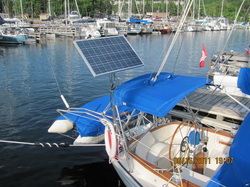 The mounting system works as planned and the solar panel performs beautifully. It looks good on the boat too. "Your pole mounting kit works great for my solar panel and for my wind generator." I purchased your 140 watt solar panel kit and liked the mounting system so much I purchased another one for my wind generator. 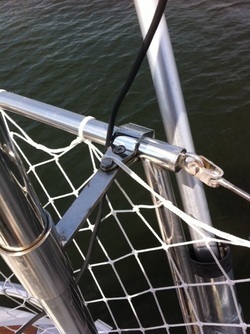 A simple sleeve adapter was used to accommodate the pole diameter of the wind generator to your 1.5"pole. I have included pictures of my installation. Thanks for all your help and advice. Both systems are working great. 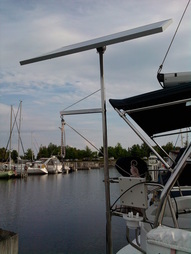 Wind Generator and Solar Panel using CMP pole systems. 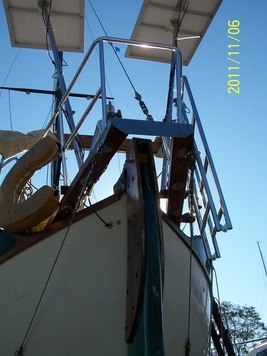 Struts added to stern rails for additional support. "On sunny days with panels oriented to the sun I have actually more energy than expected." Thank you for the two 90 watt solar systems! It was very convenient to have all pieces together (mechanical and electrical), mounting them was just “a piece of cake”! I've used you solar systems for over a year now. On sunny days with the panels oriented to sun I have actually more energy than expected – up to 16 A from both panels (16x12 = 192 Wt), with clouds – 3 to 5 A. I am able to run the fridge all the time, navigational laptop, radar (with “sleep” mode). Fridge I turn off at night, but use ice packs, which are freezing at day time. "My Dual Output controller and panel are all working great and I have told several people about your excellent products! Oh yes and excellent service too!" I have installed the controller and the monitor. Everything is working great and I am really happy with the products. We have the solar panel functioning. however we are not able to figure out the instructions on how to set the upper and lower limit for the charger as it charges up the batteries and then of course cuts off after they are full. I actually made my living as a software engineer and I specialized in technical instruction manuals. I could make a few suggestions on a re-write of those manuals for you if you like they are mostly there they just need to be augmented with some graphics and the sequence of information changed a little. Could you explain in greater detail the steps in how to set the upper and lower limits please? Ann, The upper and lower limits are automatically set based on the type of battery you select in the set up section. We are rewriting the instruction manual currently so your comments are certainly welcome. "The CMP 90 Watt solar panel keeps our refrigeration running." 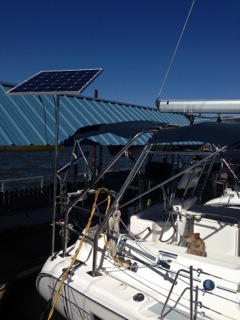 I am pleased to report that the 90 Watt solar panel performed as expected during our four week cruise this summer. 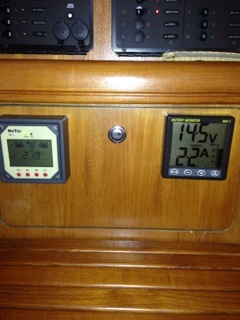 It supplied sufficient power while we were at anchor to power our refrigeration, lights and select instruments. Only on those really cloudy days did we have to run our diesel to charge the battery bank. The remote display that links to the dual battery bank solar controller is terrific. 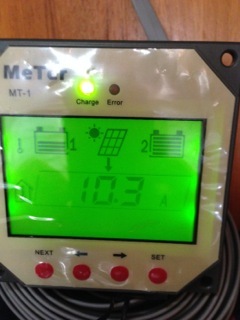 It provided me with all the information I needed to monitor my battery banks and solar panel performance. I'll send you my panel performance data as soon as I get it summarized. Panel mounts work GREAT! So do the 90 watt panels! Last Sunday I reached 15 knots peaking at 15.8! 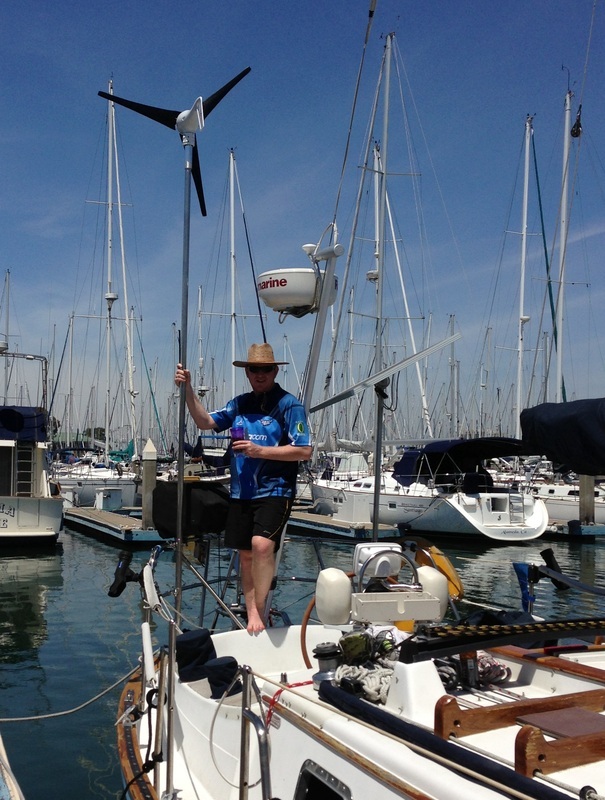 Fastest this nos so experienced sailor has ever gone under sails! 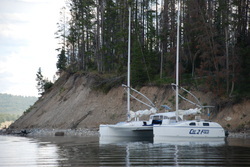 This is the second boat you have done a custom installation for me. 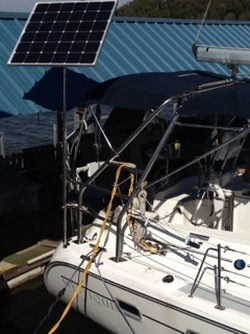 Combining the solar pole with the outboard motor hoist has really worked out well. I am impressed with the output of the 130 watt panel. Thanks for another job well done. Check out the pictures. 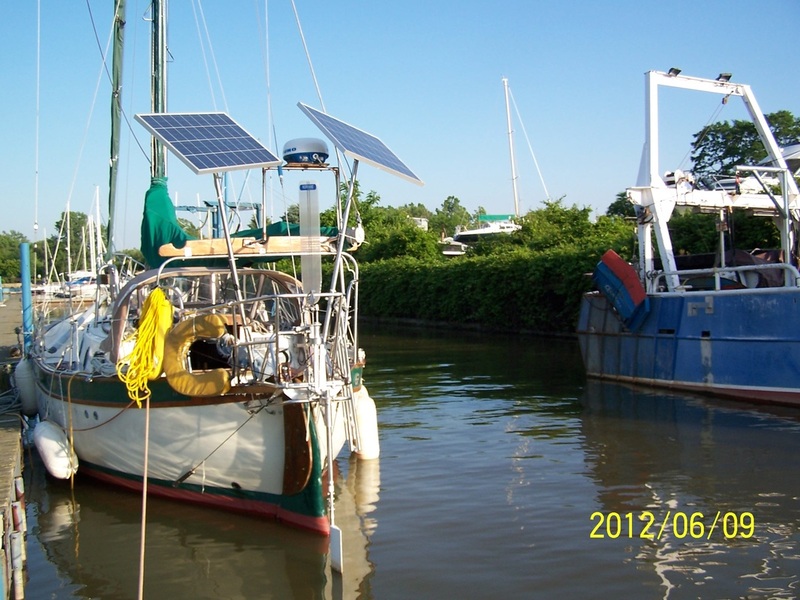 "The solar panel's performance exceeded my expectations." 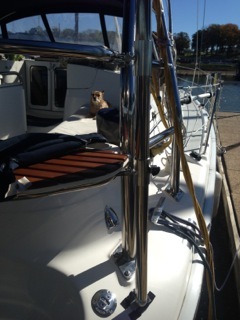 Tom, Just returned from our three week cruise to the North Channel. We got as far as Little Current after several nights at Baie Fine. It took us a bit longer to find our way up than I anticipated but great sailing none the less. The solar panel's performance exceeded my expectations. 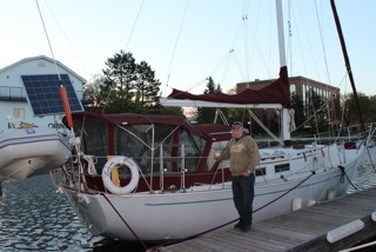 It was out of the way and didn't interfere with sailing in 30kt+ on Lake Huron. We sailed in those squalls that hit Goderich on our way to Sarinia. Thanks again for all the info on the North Channel. The GLCC membership was money well spent for the cruising guides. 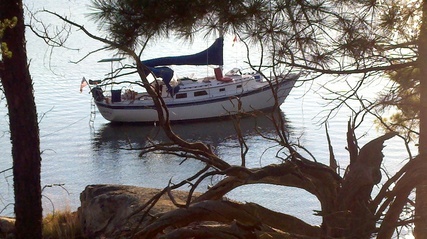 Attached is a picture of Melusina in Baie Fine. "The custom bracket you made worked out great"
Hi Tom, find some pictures attached. The custom bracket you made worked out great and the installation went smoothly. Unfortunately I have not been able to perform a meaningful long cruise that really stress test the installation with a lot of appliances running. I am still mainly working on the boat to get here ready for bigger plans and just take her our once or twice a week for day cruise. I have two battery banks with about 1200 ah capacity which are always topped off since I installed the solar panel. 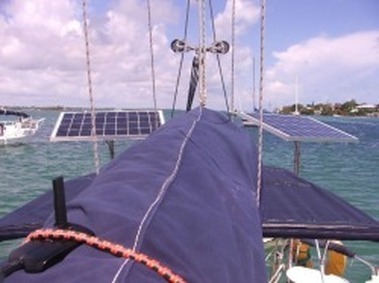 I intend to go cruising for one or two week in September and expect to use the radar and the electric autopilot and overnight anchor light which should give me a better idea how much engine running in need to complement the solar panel. Overall, the panel system has been serving me very well. "I am very pleased with the panel and mast." Hi Tom, here are a few picts. I am very pleased with the panel and mast. The installation went smoothly. Thank you for sending the bolts to replace the ones that jumped into the water. I finally found a quick-disconnect system that I liked (heavy duty, heavy guage, etc). I purchased the Marinco male and female 120 v plug ends. I waterproofed all the internal hardware of the plugs with liquid electrician's tape and will wrap this in a Sunbrella/velcro system that I need to make. The system connects and disconnects EASY. I have a feeling that this feature will be important when it comes time to taking the panel down in heavy weather. As you can see I felt that it was more seaworthy/ esthetic to run the cable through the mast itself as opposed to wire-tying it to the outside. This has worked great since I put a loop of cable at the base to allow for mast rotation. Regarding your blog: I believe that this only applies if one has a "smart alternator" right? I have a "dumb" 80A one so I don't think I need to shut down the panel while the auxiliary power is on. Is this correct? Thanks for the pictures. Nice installation. I think wires inside the pole may become an option for us to offer as that is a request we are often getting. I like your installation. MC4 connectors do give you the ability to quickly disconnect the solar panel. 1. You will know if you have a conflict between your controller and alternator if your tach starts jumping around. This would indicate a conflict due to pulse width modulation (PWM) of the alternator and controller. 2. If you see the alternator is not charging the battery bank, it may be due to artificially high voltage from your wind and solar your alternator regulator is seeing and thus putting it in float mode. "I am a well satisfied customer." Hi Tom. 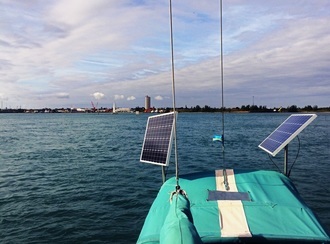 We went out on the anchor for a day this weekend, and I played with the solar panel most of the day. Every good sailor is a "type A" and needs to be fiddling, adjusting, resetting something and I am no exception. Anyway as to results, much better than expected. 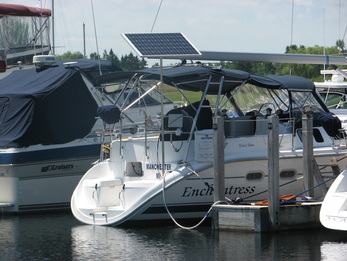 We left the dock fully charged, of course, with the panel connected and producing, under a clear sky. 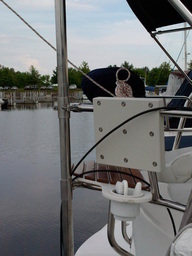 I can adjust the pole setting from the helm as needed according to boat angle. 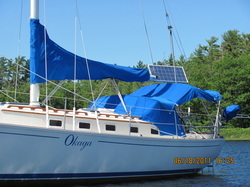 We ran fridge, lights etc over night while on the anchor. 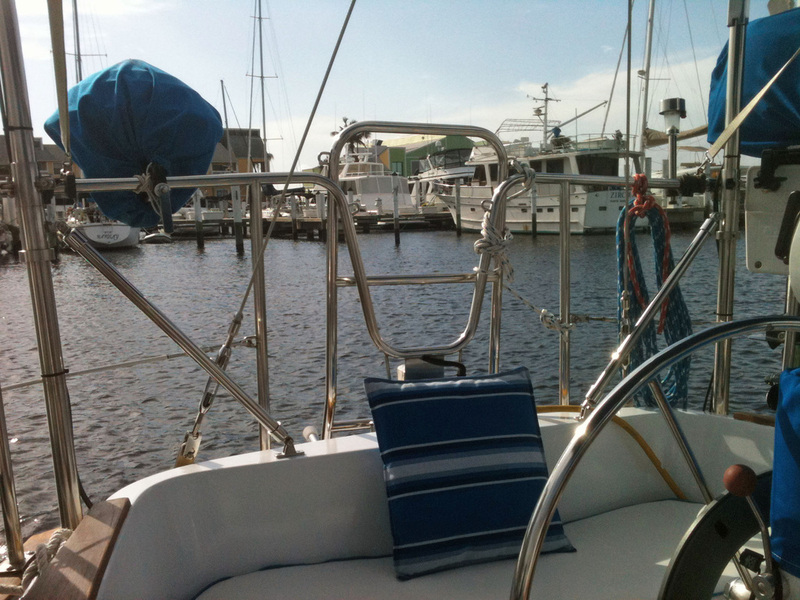 The day on the anchor was a bright, full sun day in which I regularly adjusted tilt and angle for max output. The panel charged at 20.2V; I clocked between 5.5- 5.9 A most of the day. By 15:00 hours, the batteries were fully charged and the amps had dropped to 1.5A. I am a well satisfied customer and I took the attached photos for you. I do have a question. After leaving the dock, I noticed that my engine Tach was bouncing around, non responsive. 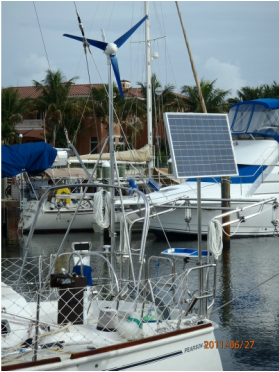 ( I spoke to another boater with a large panel and an electricity background who had the same issue when his batteries were fully charged and the panel operating). This effect disappeared on the return sail, when the panel and engine were actively charging. Odd, ehy? 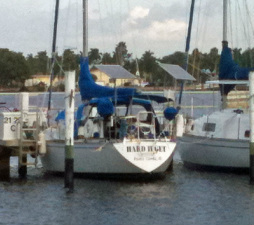 I recently had a similar experience on my boat and did some research. Most high output alternators and many controllers charge batteries using a technology called Pulse Width Modulation (PWM). The Tach uses PWM to determine the alternator (and thus the engine) RPM. The two PWM sources may, at times, create an interference. Thus the sporadic readings on the Tach. The solution to this is disconnect the solar panel when the alternator is running so the controller doesn't function. This can be easily done by putting a switch in the positive wire leading from the solar panel to the controller. Alternatively, you could put in relay on this wire and wire it so the relay is open when the engine is running and closed when it is not. Another reason to put a switch in is this. 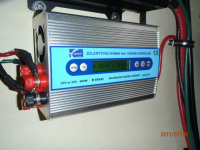 The smart regulator reads the battery charge condition and sets the output of the alternator accordingly. If the solar panel is producing power, the regulator will see the net of the battery charge and the panel output and thus prematurely put the alternator in float mode. 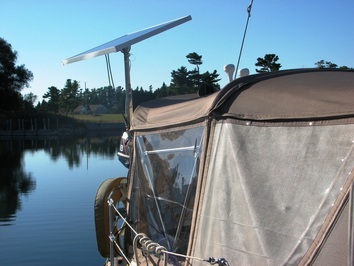 I purchased the top-of-pole solar panel mount several months ago and am very pleased with it. I am using a Kyocera KC85TS 85watt panel and a controller I purchased from foster-wills.com as suggested by Custom Marine Products. This has almost eliminated my need to run the engine to charge the batteries when we are at anchor for several days at a time. The panel is easy to tilt and rotate for optimum sun angle. I also purchased the outboard motor crane. What a great concept; two functions from one pole. Nice job CMP! I purchased two 75 watt solar panels from a factory outlet and couldn't figure out how to mount them. I asked Custom Marine Products for advice and they custom designed and built a mounting system that is perfect for my needs. 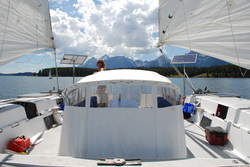 It is above the bimini out of the way and enables me to tilt the panels for proper sun angle. Now I don't have to run the engine to charge my batteries. Add your comments by emailing us or use the "Contact Us" comment box.